It takes a little while to adjust to an apartment in Paris. For instance, the kitchen in my rented apartment, where I imagined creating fabulous pastries and French dishes, was once a closet, or should I say 1/2 a closet (the other half has the washing machine, a vacuum, and a little space for my clothes). In the so-called kitchen, I have two burners, a college dorm-sized refrigerator, and a microwave. I knew the kitchen was going to be small, but the information about the apartment online said it had a microwave/oven. Unfortunately, there is no oven, only a microwave. I’m going to have to get creative to make these pastries, but we’ll see what I can do. Then, there’s the bathroom. The bathroom has just enough room between the toilet and the sink for me to slide between them sideways and wash my hands in the sink. The shower is about 3 feet by 3 feet; however, the way the shower curtain hangs into the shower, it cuts off about 1 1/2 of the feet. I now have 3 feet by 1 1/2 feet of room. Basically the point is to shower fast, and moving is out of the question, or expect water to flood out into the rest of the bathroom.Somehow after only three days here, I managed to take a shower without flooding the bathroom floor. The three towels I had put down to absorb the gallons of water that would flood out from the shower (I’ve been known to flood bathrooms in Europe, to the point that the water drips to the room below) were DRY. Yes, the floor was dry! I had adjusted, and now I was ready to conquer Paris. 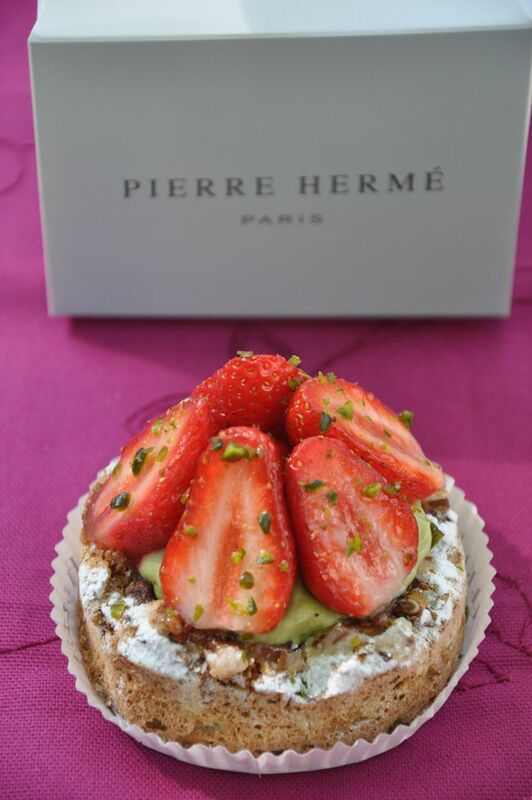 I had reason to celebrate and the best way to do that was to indulge in a Pierre Herme pastry in my favorite park in Paris. Pierre Herme is one of the best pastry chefs, if not THE best, in all of France. When visiting Paris, you shouldn’t miss going to one of his shops. His pastries are perfectly constructed, he combines unique flavors and textures, and the pastries taste as good as they look. His shops look a little unapproachable, and it can feel like you’re at Tiffany’s instead of a food shop. They even place the pastries in a box, specially made for Pierre Herme. Many patisseries in France have these specially made boxes. It’s sunny today, and I’m headed straight to the Notre Dame Cathedral, or actually the back of Notre Dame. While so many tourists, and gypsies, are clamoring around the front or the sides of the cathedral, few are behind it in the park. The park is named Square Jean XXIII. It’s a peaceful and scenic escape to enjoy my pastry. 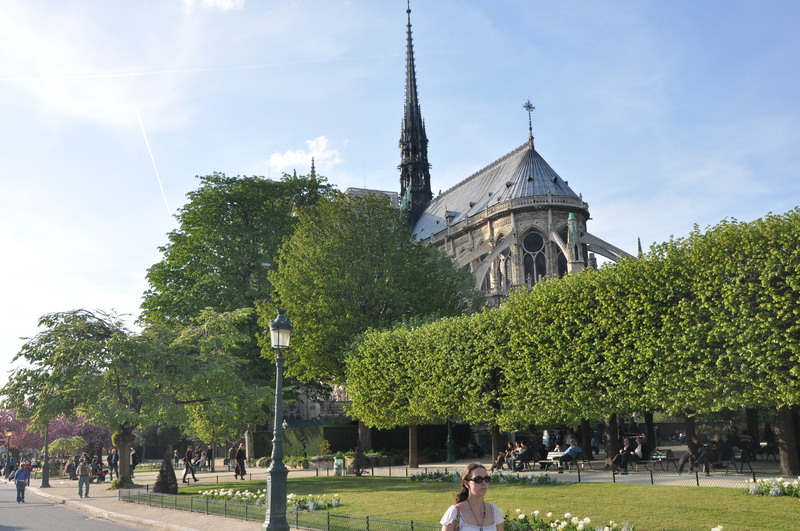 From my park bench, I gaze at the flying buttresses of Notre Dame, the greenery of the trees pruned perfectly into 90 degree angles, the tulips in bloom, and a few children running around or away from their parents. 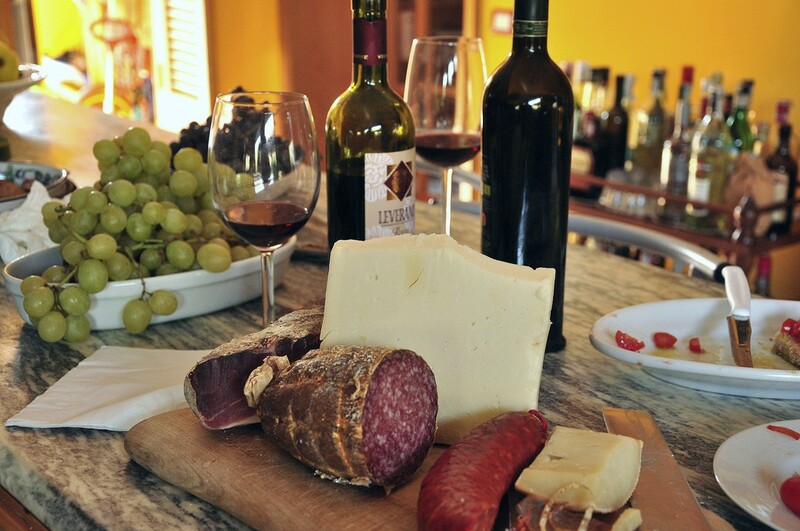 It’s a great place to take a sightseeing break or to enjoy a croissant, sandwich, crepe, or even a pastry. The pastry I’ve chosen for today is called “Montebello Individuel.” It’s an individual sized pastry with a pistachio dacquoise (cake made with meringue and ground nuts—in this case, pistachios), pistachio pastry cream and strawberries. Simple yet a perfect blend of crunchy (the dacquoise has a crunchy crust), creamy (pistachio pastry cream) and sweet (strawberries). After enjoying this pastry, I decide I will try a different patisserie and pastry each day I’m here and report back to you. It’s rough work, I now. As I walk on to my next desitination, I cross the street and almost have my hip nicked by a car. I am instantly reminded that the French see crosswalks, as many of us Americans see yellow lights, only as a suggestion to stop; even when there are pedistrians in the middle of the crosswalk. OK, so I have a long way to go before I conquer Paris. I’m here for a month, and I’ll keep trying. In the meantime, let me know what are your favorite patisseries in Paris, your favorite parks, or places you would like me to “conquer” while I’m here? I absolutely love this idea — very clever. I look forward to hearing and seeing more. When I was in Paris (1985 to be exact) My friend, Julie and I visited a narrow bistro where one of her friends was playing in a small band — his apartment sounded about the size of yours without the bathroom. I would love for you to take the challenge of visiting one of the local dark, narrow, and smokey bistros and report back to us. Also, maybe have tea or whatever they have there in one of thos swanky hotels and send photos. So jealous you’re doing this — how fun! Enjoy and be safe. Take some pictures of your flat! Drew: Pics of my flat are coming soon in a future post! I think you can guess: I’ve emailed you a list of places where you can take tennis lessons. 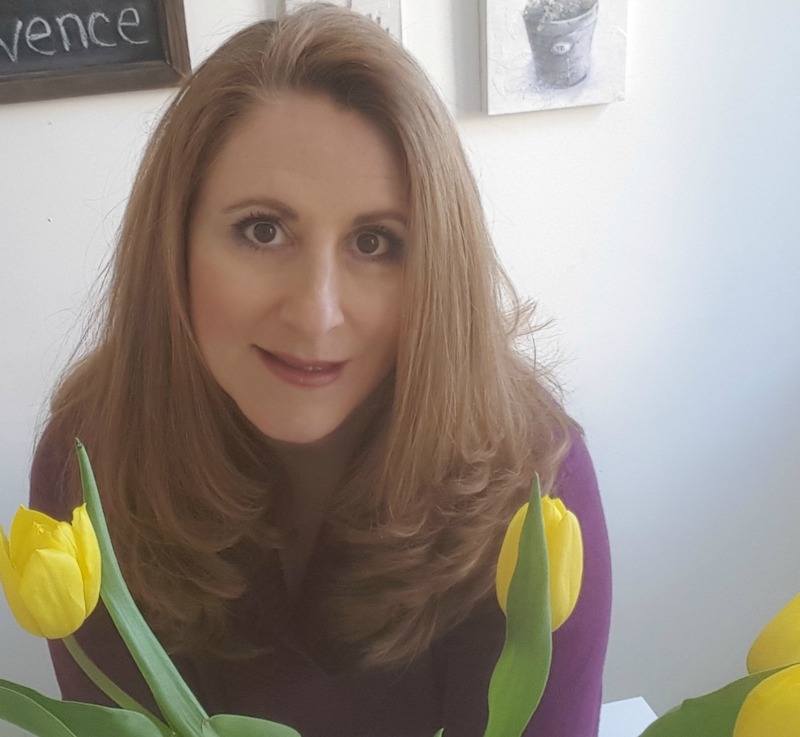 Susan: I will certainly visit a dark bar (yay! they can no longer smoke inside, so they’re not smoky anymore). I thought about going to the Ritz for their Tea Time at their Bar Vendome (www.ritzparis.com), but a slice of cheese cake is 21 euros and an eclair is 19 euros. So, if you will forgive me, I decided against it. (I can make at least 20 eclairs for the price.) But, I have been and will go again to my favorite salon d’the, La Duree, and two others and will soon have a post about it.